Welcome to one of our Westralia.Net web sites! 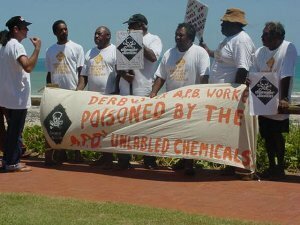 This site is to highlight the plight of the WA Government's treatment of former Agricultural Protection Board (APB) workers who used herbicide around the 1980's in the Kimberley region of Western Australia. Many are prematurely dead, many permanently disabled or sick. Other workers from other regions may also be affected. We believe that the chemical used was not standard production 245T as the Western Australia(WA) government wish the public to believe, but in fact highly TOXIC WASTE, being an off-specification 245T containing extremely elevated levels of dioxin. This chemical was criminally supplied by the WA Government to the workers in second hand unmarked drums. The substance had completely different physical characteristics than conventional 245T. This site will educate you on the "games" that have been played by the WA government avoiding their resonsibility while innocent people die and suffer. Survivors, literally left for DEAD! Click on the photo to see related story.